The Immortal jellyfish is one of the most unique animals not just within the species of jellyfish, but within the entire history of the animal kingdom. It has actually managed to accomplish the one feat that has been yearned by many and accomplished by none. How does the immortal jellyfish accomplish this feat? It is through cell development process of transdifferentiation. What this means is that it can alter the differentiated state of the cell and transform it into a new cell. In this process of transdifferentiation, the medusa of the immortal jellyfish is transformed into the polyps of a new polyp colony. First, the umbrella reverts itself and then the tentacles and mesoglea get resorbed. 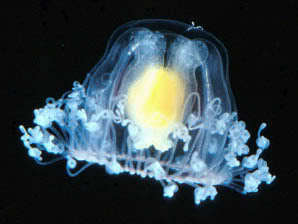 The reverted medusa then attaches itself to the substrate by the end that had been at the opposite end of the umbrella and starts giving rise to new polyps to form the new colony. Theoretically, this process can go on infinitely, effectively rendering the jellyfish immortal. This entry was posted in 5% acetic acid/Vinegar on jelly stings, Box jellyfish, florida-jellyfish-portuguese-man-of-war-florida-beaches-long-island-beaches-hawaii-waikki-oahu-guam-austalia-stingersmauve-jellyfis-pelagia-nortiluca-black-sea-nettles-stingrays-sport-fi, Irukandji, jellyfish, jellyfish species, jellyfish sting first aid, Jellyfish sting remedy, jellyfish stings, Jellyfish stings, vinegar, acetic acid, Lion's mane jellyfish, Man of War, marine sting first aids, marine stings, Pacifici coast sea nettles, Pelagia Nortiluca, sea nettles, StingMate, Uncategorized, Vinegar on Jellyfish stings. Bookmark the permalink.